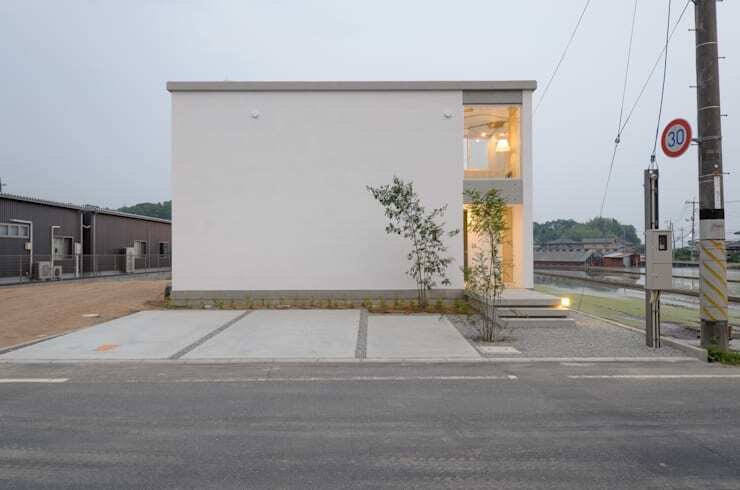 The minimalist facade is almost windowless and presents as a simple white cube. There is plenty of subtle variation however. The front area is paved in alternate shades of grey and the entrance area has a couple of small trees. Finally, note how the facade is almost windowless. The windows of course are contained within the elongated entrance area. From the first steps, we get a sense of the elevated feel that defines this home. The concrete steps appear to float because the risers are recessed into the structure. Note how the large glass wall and window panels on either side of the door encourage the eye to move in a vertical direction. The living room here presents our first glimpse of the raw and industrial-style interior. 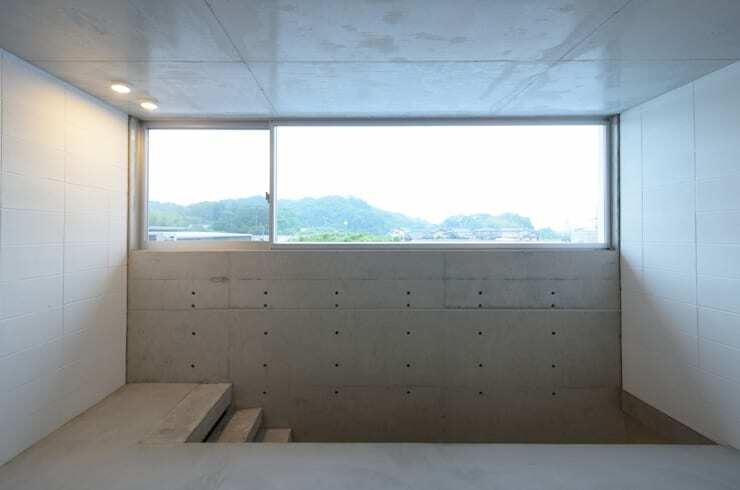 The floors are made from concrete panels and the kitchen countertop from steel. A few wooden furnishings add an almost retro, Scandinavian-style feel as well. In typical contemporary Japanese style, there are very few decorations and the quality of the raw materials provides a simple decorative feel all on its own. 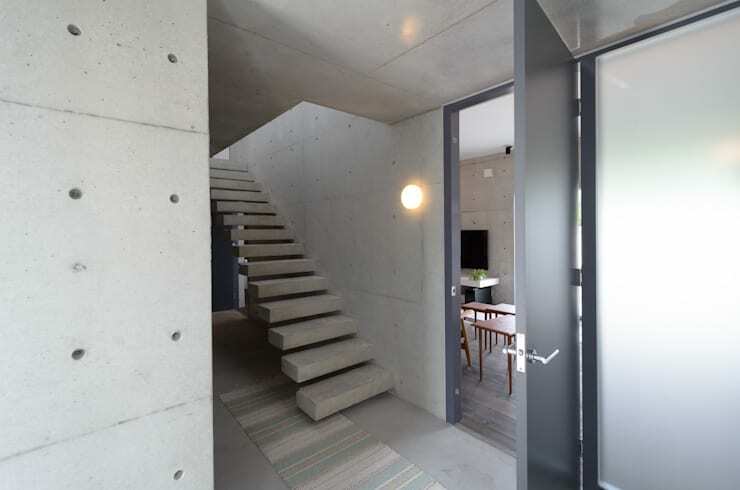 The raw concrete finishes and monochrome palette is quite striking in the hallway or passageway. The staircase is made from floating concrete steps that further add to the bright, elevated quality of the home. Keen-eyed readers might note that the stairs have a very rough finish. This is a clear nod to the ideas of authenticity and imperfection that really drive this style of design. At the top of the staircase we have a long horizontal panel window with a carefully framed view of the mountainscape. 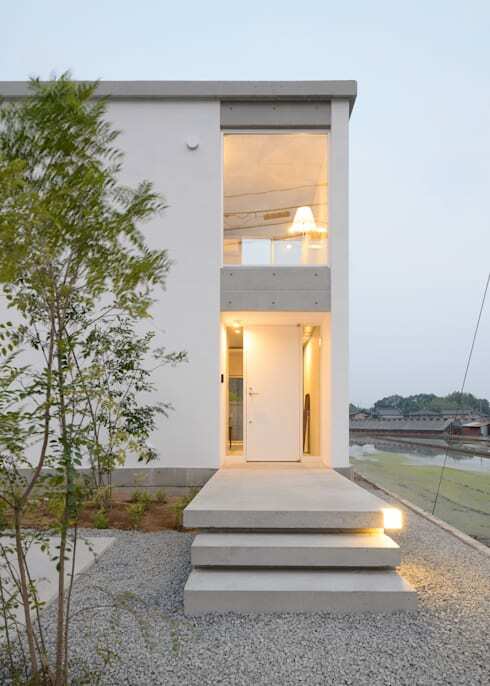 Picturesque views are a big part of both traditional and contemporary Japanese architecture. They are used to encourage one to appreciate the beauty of nature. Also, note how there is absolutely no railing or bannister at the top of the stairs. It's a daring approach! The upper level has a very interesting ambience that is both open and entirely private. The enclosed terrace has high walls that still allow a lush view of the mountains. The living area up here is sparsely furnished and the raw materials and natural benefits of the space are really allowed to define the look. 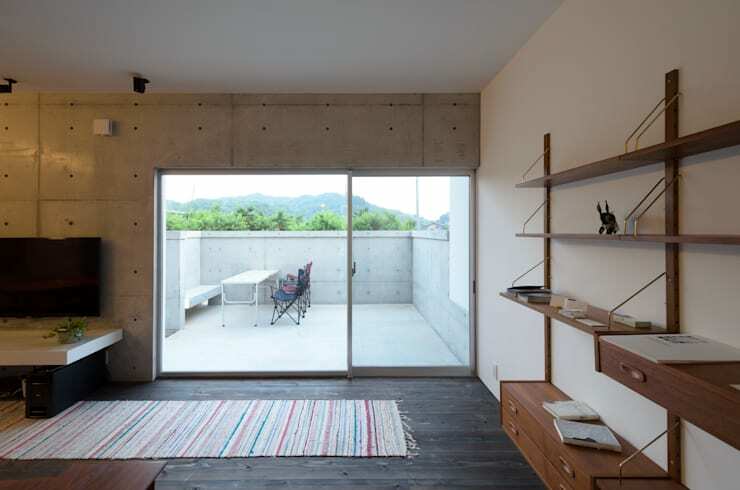 This is certainly a Japanese home designed with great precision and restraint. If this home inspired you with its simplicity, you'll love The 25sqm apartment with everything. 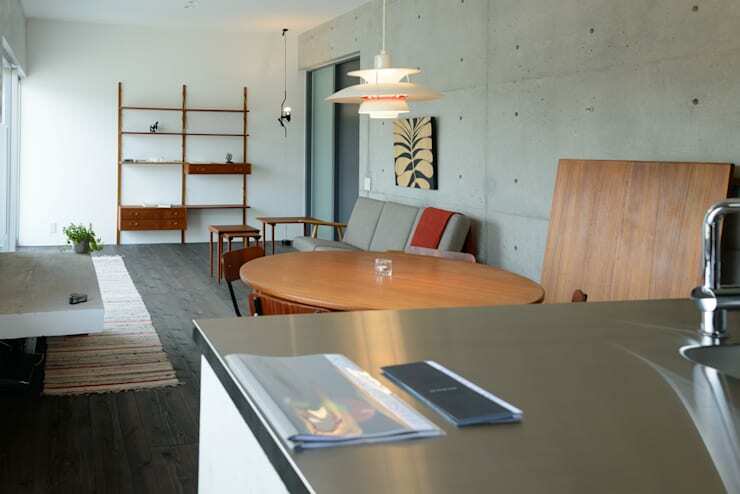 What do you think of the use of concrete in this home?